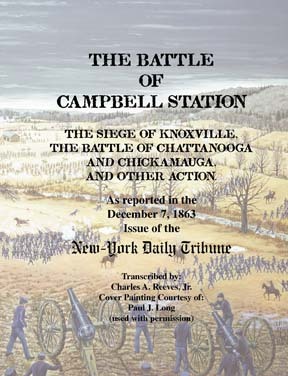 Civil War Catalog - Charles A. Reeves, Jr.
Battle of Campbell Station. A 47-page booklet, an original publication by Charles A. Reeves, Jr.. It is 8-1/2" x 11" in size, and is a transcription of an article that appeared in the December 7, 1863 issue of the New-York Daily Tribune. It includes information about this battle, as well as the Siege of Knoxville, The Battles of Chattanooga and Chickamauga, and other action. Several color images include one of an original painting by Paul J. Long (used with permission). Paperback, professionally bound and published; ISBN 978-0-9800984-0-2. The Defense of Knoxville. A 26-page booklet, an original publication by Charles A. Reeves, Jr.. 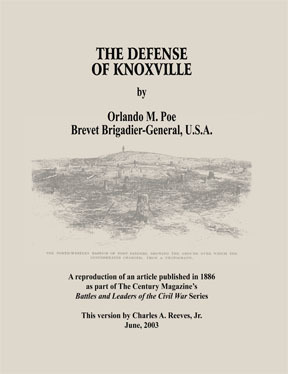 It is 8-1/2" x 11" in size, and is a reproduction of an article by Orlando M. Poe, Brevet Brigadier-General, U.S.A., that was published in 1886 as part of The Century Magazine's Battles and Leaders of the Civil War Series. Paperback, professionally bound and published; ISBN 978-0-9832996-4-6. The entire contents of this page copyright 2000, 2001, 2002, 2003, 2007, 2008, 2013 Charles A. Reeves, Jr. This page last updated October 3, 2013.